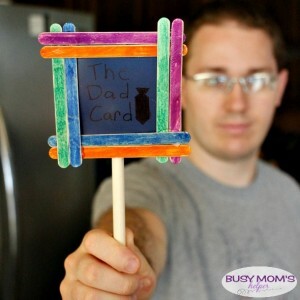 Guys, I’m super excited to share today’s Father’s Day craft with you – The Dad Card. You know how people say ‘man card’ or they’re going to ‘pull the parent card’? This means they get to trump a decision, or get the final say. Give Dad his very own ‘Dad Card’ so he gets priority for decisions on his special day! The best part – you can make it really quick and easily using on-hand supplies! Fun, right? I’m eager to see what things hubby pulls HIS Dad Card for 🙂 Now, for mine I used whatever supplies and scraps I had on-hand, and you can do the same. Just make little tweaks as you need if you have different random supplies. No need to spend lots of money! Use your markers/paint to color the popsicle sticks as desired. Use your hot glue gun to secure them into a frame – overlapping as I did, if you want. Glue your scrap cardstock/paper/etc. (I used an old paint color card) behind the frame so you have the centerpiece. Attach your handle (or cheap brush, whatever) and then add your text by writing it or using stickers. That’s it! It’s easy for the kids to help – coloring the sticks, choosing the sticker/text, even helping with the gluing (with high supervision). Great affordable and EASY Father’s day gift from the kiddos! How awesome is this Steampunk Dad Mug from Michelle’s Party Plan-It? Love it! It’d be saying A LOT in our house if the kids loved Daddy more than LEGO – so this card from Scrappy Chick Blog would be perfect! I love this Best Dad Duck Tape Gift Card Holder from Mad In Crafts – makes me think of the Guardians of the Galaxy mixed tape! I never knew a DIY Pop-up Card, like this one from Raegun Ramblings, was so easy to make! So many great ideas – whip up your favorites, and don’t forget to give him his own DAD CARD! 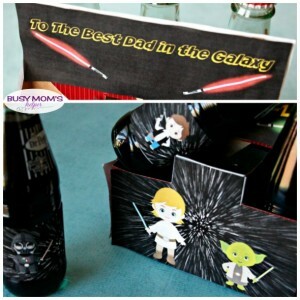 Another day of fantastic and EASY Father’s Day crafts with this month’s Craft Lightning! I love how our Button Art Dad Gift turned out – so simple, yet a lot of fun for the kids. Plus a good excuse to use a lot of my random buttons I tend to stock up on! Choose your own colors and styles for this Father’s Day Button Art and get crafting! Just like yesterday’s Fingerprint Dad Gift, you don’t need a ton of supplies. After all, the whole point to Craft Lightning is simple crafts in 15 minutes or less (minus drying time). Outline your DAD letters (and we put a tie at the end, so all 4 kids had their own) with the pencil. Select your buttons. Doing the edges first, and a section at a time, use the hot glue gun on the canvas. Use the toothpick to press each button down onto the hot glue, working in sections until the whole letter (or shape) is filled. Allow to dry, then hang or display! I love the texture of the all the fun buttons, don’t you? It just adds some fun dimension to this Dad Gift. Here’s the features from yesterday’s Craft Lightning group! 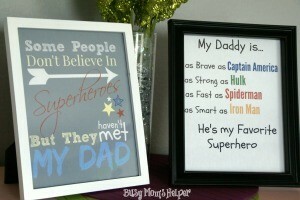 What a cute Daddy Daughter Picture Frame from Practically Functional! Do you think Dad would share some of this yummy S’mores Bouquet from Seven Alive? 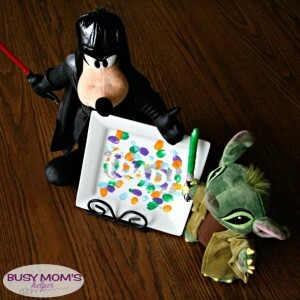 I really want to make these Shrinky Dink Tie Tacks from A Girl and a Glue Gun with my kiddos! I bet this Kid Made Beard Oil form My Very Educated Mother smells fantastic! I’m a big fan of cute mason jar crafts – so love this Father’s Day Mason Jar from Gingersnap Crafts! I can think of several places these Essential Oil Air Fresheners from Hydrangea Hippo would be useful! Check back for more great Father’s Day Gift Ideas tomorrow, and grab those buttons for our Button Art Dad Gift!